The London Conference is firmly established as the unique event in the calendar where leaders from across London and the globe come together to discuss the future of the capital. The London Conference combines speakers of international renown with an informed and engaged audience to create the exchange of ideas and strengthening of networks that we believe will change London for the better. The London Conference is carefully and imaginatively curated. Each year the conference programme is developed to address the most pressing issues facing London. It includes a variety of formats – keynote speeches, panel discussions, quickfire presentations and interviews – making for a buzzy and stimulating event. In previous years we’ve explored the challenges faced by London as the balance of economic power shifts across the world, discussed the priorities for the new Mayor of London, and provided a platform for debate about what London should be looking for from a new national government. The conference has a reputation for attracting influential speakers and high-level attendees. Previous speakers have included current mayor of London Sadiq Khan; former mayors of London Ken Livingstone and Boris Johnson; deputy mayor of New York Alicia Glen; former president of Colombia Álvaro Uribe; former UK Foreign Secretary David Miliband; Chairman of LOCOG, Sebastian Coe; and Baroness Martha Lane-Fox. 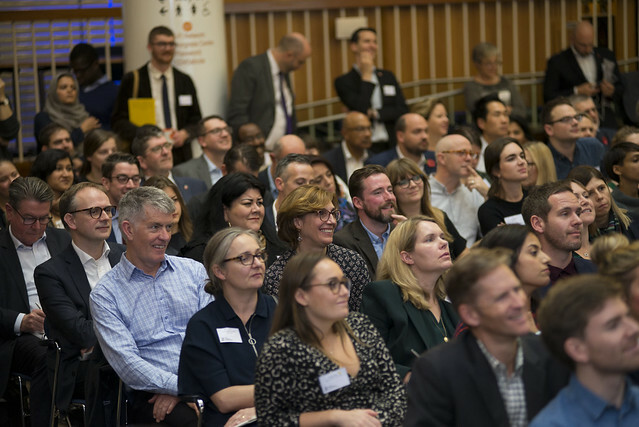 The event is usually supported by a coalition of business, public sector and voluntary partners; we work hard to bring funders from different backgrounds together. In previous years, partners have included Capital and Counties Properties PLC, City of London Corporation, EY, Future Cities Catapult, Home Group housing association, J.P. Morgan, JLL, London Councils, McKinsey & Company, Peabody, the Port of London Authority and Trust for London. Cities are not just run by governments: they’re run by networks of experts from different sectors, and it is essential that these people exchange their ideas. The London Conference exists to facilitate this exchange. Ben Rogers, Director, Centre for London. The London Conference is an invite-only event for senior business, third-sector and local government leaders. You can now register your interest in receiving an invitation to the 2019 conference. As places are limited, we will notify you via email whether we are able to accommodate your request up to one week before the conference date.